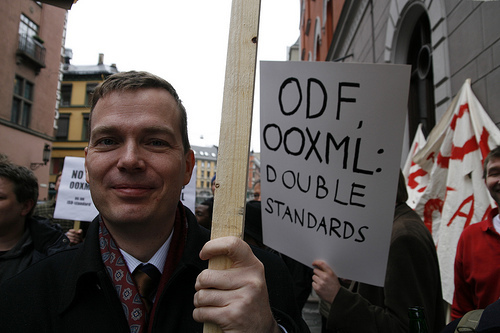 A lot has been happening recently in Denmark [1, 2, 3, 4, 5, 6] where OOXML received a cold reception and abuse of the process was clear for all to see. According to one report, an appeal came from there, but we haven’t a confirmation. As for Venezuela, it’s confirmed to have filed an appeal. A list of incidents from there you can find here. The country is moving towards Free software. Here is what seems like the earliest report about Venezuela’s appeal. The author too reluctant at this stage to include Denmark in the headline, but we will update this post accordingly when it clears up. Venezuela has joined the list of countries that have lodged appeals against the adoption of an international standard based on Microsoft’s Office Open XML (OOXML) file format. By Monday, though, the IEC had relaxed its interpretation of the directive: Venezuela’s appeal, although filed after May 29, “was filed within the two months of the BRM [ballot resolution meeting] closing so that it is being accepted. (The BRM closed on 29 March 2008 so the interpretation is that the last calendar day of May is being applied),” Buck wrote in an e-mail. Computerworld Denmark reported Friday that Denmark filed an appeal with the ISO, although spokesmen at the IEC and ISO would not confirm that. “I have no confirmation of the Danish report and cannot comment further on that,” the IEC’s Buck said Monday. Has EMCA released the final version of OOxML to ISO, yet? I don’t believe they have. Had they done it, one of the ODF/OOXML bloggers would said something. I understand also that Groklaw has posted an article on this. It’s looking more and more like Denmark really has made a formal appeal. Thanks, Roy. That’s a good link. I was actually about to post an update about Denmark and Germany shortly (got some new info). DIN too seems dismissive at the moment. I remember some article about this from September 2007. Misconduct was noted, but it was in Spanish, so I could not read it (I cited it instead).